this photo shoot was just so creepy-cool that i had to share it. 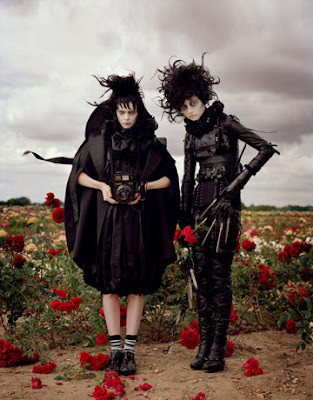 it's for a tim burton inspired photo spread in harper's bazaar. i have a weird fascination with ghosts (well, ghost stories), the addams family, halloween, and the like. i never got into the "goth" look myself, though. but yes, my favorite tim burton movies would have to be "the nightmare before christmas", "big fish", "charlie and the chocolate factory" and "beetlejuice". oh, and "sleepy hollow". i'm really looking forward to "alice in wonderland" when it comes out! if you're in new york, he has an exhibition at moma from november 22nd, 2009 to april 26th, 2010. wish i could go. ...which reminds me. i don't even know what i want to be for halloween yet! agh.